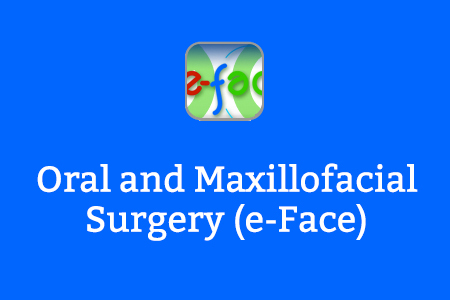 e-FACE is an online resource for oral and maxillofacial surgery (OMFS). It has been developed by the British Association for Oral and Maxillofacial Surgeons in partnership with Health Education England e-Learning for Healthcare. e-FACE is designed to support junior trainees working in OMFS departments. The content is partially aligned to the Dental Core Training (DCT) Curriculum and is designed to complement the first year of DCT. The content is also suitable for all junior trainees working in OMFS departments and as refresher material for those starting their specialty training. The sessions feature interactive learning, videos and case studies and all contribute towards Continued Professional Development. The formats vary from ‘bite size’ sessions to longer more in depth reviews of topics. They are available to access wherever there is an internet connection and are fully compatible with mobile devices. The e-FACE project will be structured into 16 modules, covering the majority of the Dental Core Training Curriculum. It will be delivered as a blended learning solution to support existing local and regional training. Each of the sessions will include self-assessment with feedback to reinforce learning. There are some areas of overlap with other projects currently being delivered by HEE e-Learning for Healthcare, in particular Plastic, Reconstructive and Aesthetic Surgery, Dentistry, Anaesthesia and Radiology. These areas were identified to avoid duplication of material, all e-FACE material being bespoke for the target audience of junior trainees in OMFS. There is signposting to useful material in other projects where applicable. If you already have an account with e-LfH, then you can enrol on to the Oral and Maxillofacial Surgery programme by logging in to the e-LfH Hub, selecting My Account > Enrolment and selecting the programme. You can then access the programme immediately in the My e-Learning section. The Oral and Maxillofacial Surgery programme is also available to NHS healthcare staff via the Electronic Staff Record (ESR). Accessing this e-Learning via ESR means that your completions will transfer with you throughout your NHS career.